Honey bees may establish a nest inside the wall of the house or other building causing a nuisance, a health hazard and a serious threat to the structure. However, not all “bees” that nest in the wall are honey bees. It is much more likely that the insects that look and behave like honey bees and are nesting inside the house wall or foundation are yellowjacket wasps. It is easy to confuse the two insects so careful examination rather than assumption based on distant observation is essential. Honey bees and yellowjackets are nearly identical in size, shape, general appearance and behavior. Color is the easiest distinguishing characteristic. Honey bees are fuzzy and golden brown. Yellowjackets are shiny and lemon yellow with black markings. Honey bee colonies in wall or attic voids are a much more serious problem than yellowjacket wasps. 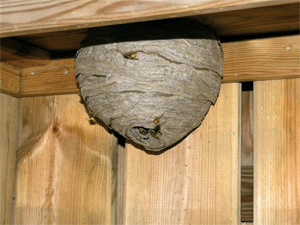 Yellowjacket colonies are annual and the wasps will disappear in the winter with or without treatment. Honey bee nests may last for many years without treatment and will contain honey stored inside the walls. The honey can ruin walls and ceilings if it is not removed. Salvaging honey bee colonies from wall voids is usually not practical, so extermination is recommended. Wild honey bees are of very little or no value to a professional bee keeper as they are often heavily infested with parasites and diseases. Call me old school but I prefer to talk to my clients in person rather than rely on email, texting, Facebooking, Twittering and all that other 'cutting edge' technology stuff (actually, it befudles me) So, call me, I'll answer - or at least get back to you right away - and we can discuss your options. Guardian Pest Control | All rights reserved.